Have you thought of including prune puree in your little angel’s diet? Do you know how prune puree can benefit her? If you were looking for ways to prepare prune puree or you simply want to know how it is beneficial for your darling, read our post. Here we look at some simple recipes to prepare prune puree. Prunes are dried plums. These fruits are rich in dietary fiber, Vitamin A & Vitamin C. They contain a low cholesterol and sodium content. For such high nutritional value, prunes help promote digestion and ease your baby’s constipation. Prunes don’t pose any allergy risks to babies. Your baby can safely consume prune puree. Prunes contain a small percentage of simple sugars, but do not increase the blood sugar levels. They contain a high proportion of dietary fiber and fructose and have a low glycemic index of 29. 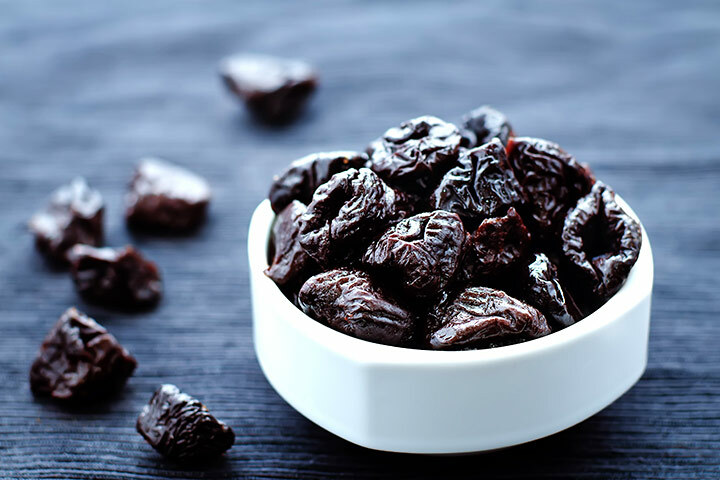 Prunes are rich in carbohydrates and contain a small proportion of protein. They are one of the best sources of dietary fiber. Prunes are a good source of vitamin A, Vitamin C, and Vitamin K.
Prunes contain a small proportion of essential minerals including potassium, copper, boron, and magnesium. How To Make Prune Puree For Baby? Wash the prunes with water. Add the washed prunes into a saucepan filled with water. Put the saucepan on medium flame and bring the water to boil. Reduce the heat after 10-15 minutes and check if the fruits are tender. Cool down the heated mixture to room temperature. Put the tender fruits into a food blender and obtain smooth puree of prunes. You can add some water to dilute. The prune puree is ready for your baby. You can also refrigerate the prune puree for 2-3 days. Mix a small amount of apple juice in prune puree. Blend the mixture in a food processor. Delicious prune puree mixed with apple juice is ready. You can serve the puree to 8-month-old babies. Add all the fruits into the water and put the contents into a saucepan. Bring mixture to a boil over medium-high heat. Check if the fruits are tender. Add more water. Allow the mixture to cool down. Put the mixture in food processor and blend the mixture to obtain a smooth puree. You can also add yogurt to make the texture creamier. You can serve the puree to 8-month-old babies. Cut the prune into small even-sized pieces. Cut chicken breast into small pieces. Add the pieces of chicken and prune to a saucepan. Add the required amount of water. Cook the contents until the chicken is boiled. Transfer the mixture to a food processor. Blend the mixture and obtain a smooth puree. You can serve the puree to 8-month-old babies. With so many easy to make recipes, it is quite straightforward and incredibly healthy to include prune pureed recipes in your baby’s daily diet. The healthy recipes are great for your baby’s health. Did you try preparing homemade recipes of prune puree for babies? How did you make prune puree recipe for baby? Tell us about your experiences here.